We’re back! For the third year in a row, Hype Hotel, presented by Taco Bell’s Feed The Beat program, will be bringing blogger-curated music showcases to Austin. Hype Machine tracks music that bloggers all around the world are talking about and presents it all in one place for easy discovery. That’s also what we do at Hype Hotel. This year’s lineups have been selected by the terrific Consequence of Sound, I Guess I’m Floating, #MEGABLAAG, Gorilla Vs. Bear, Yours Truly, Crack In The Road, Disco Naïveté, Cruel Rhythm, ISO50, and No Fear of Pop, along with the Hype Machine team and Conflict of Interest. If you love listening to music they write about on your laptop, you’ll really love hearing it live. We’ll have the usual great stuff—drinks, tacos, Austin’s busiest photobooth, and plenty of giveaways. New this year: the Vengo Vending Machine, dispensing awesome prizes to Hotel guests. Try it out! 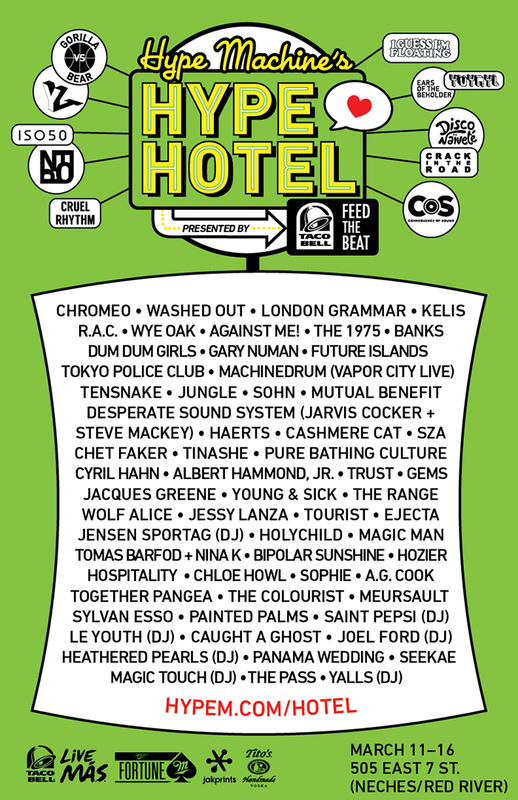 Hype Hotel would not be possible without our presenting sponsor, Taco Bell, and their Feed The Beat program. Dedicated to fostering music discovery, Feed The Beat selects 100 artists every year to receive $500 in Taco Bell gift cards. Submissions are now open at feedthebeat.com. Hype Machine’s Hype Hotel: 505 East 7th Street (between Neches/Red River), March 11-16. RSVP is now open for free day shows. SXSW badges/wristbands have priority, but a very limited number of Day wristbands may be admitted. Will there be an an age restriction? Friends and I are 18 and have RSVP’d, but have not seen any of that information. NO TACOS TODAY? wtf. ALL HYPE NO TACOS. I thought it was FEED the beat.